“Clean Country Living” in this 2,500 sq. ft., modern 2 story home. 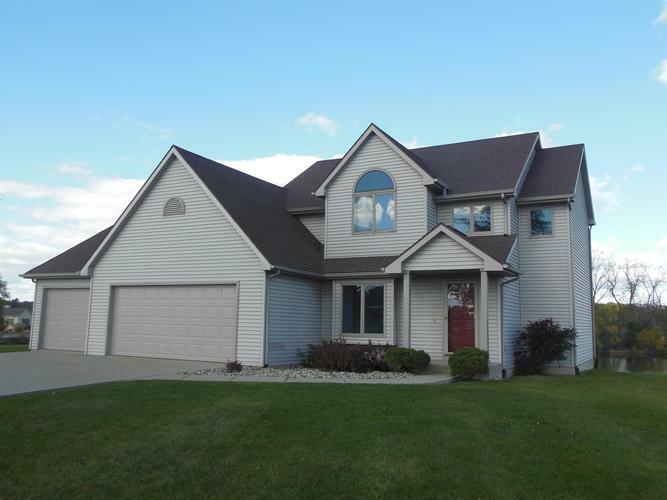 Built in 1998 this home has 4 bedrooms, including 1 in the full, finished daylight basement, 2 ½ baths, open kitchen & dining area, vaulted foyer with open stairway, a rear family room (w/ a beautiful rear view of the pond, nature & wildlife) & front office/den. The master suite has a double sink vanity, whirlpool tub, separate shower & commode area & a walk in closet There is a 3 car attached, heated garage, LP gas heat (w/ buried 500 gal. tank), central air & a complete new roof (2 months ago). Along with the pond as part of your playground, there is a also a jungle gym play set for the kids. All this on 4.6 country acres, conveniently located between Butler & Auburn far off the road on CR 40. Eastside Schools. Listing provided courtesy of Brown & Co Realty-Auctions, Inc..